Whether you love the decadent flavour of rib-eye or the tenderness of filet mignon, Hong Kong’s got a range of steakhouses to appease your appetite. The tricky thing is, with so many options, picking the right one can be a real struggle. In a bid to answer your meat musings, we scoured the city to find our favourite spots for steak. Enjoy, carnivores! 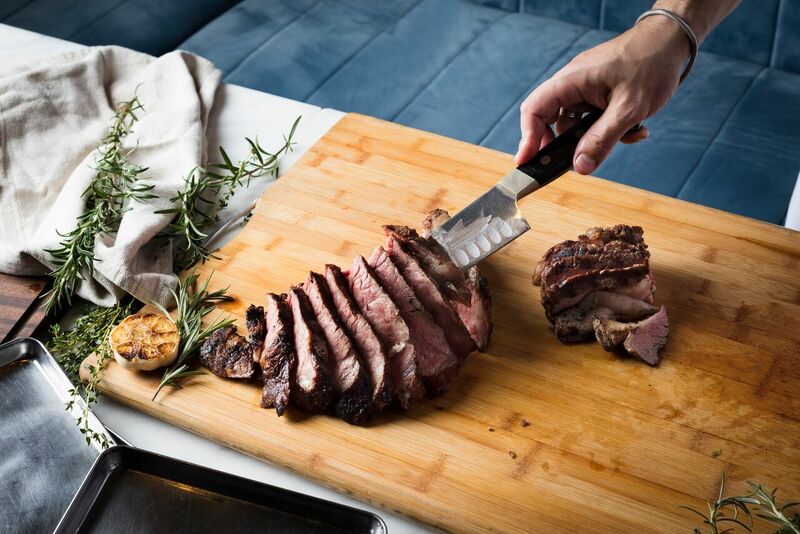 The new kid on the block at Wan Chai’s QRE is hEat, a steakhouse that promises an extreme grill experience. Our expectations were met with its range of meats, but the star of the show is none other than their Limousine Ribeye Beef. It’s love at first bite with its powerful meaty flavour and notes of blue cheese and nuts, thanks to the in-house dry-ageing process that requires over 60 days of incubation. Alongside its meat selection is also a sizeable seafood menu for those who love a good surf and turf. Wine-pairing menus are nothing new but they’re popular for a reason — together, food and wine unleash a unique marriage of complementary flavours. It isn’t as common, however, to come across a meat and sake tasting. Lawry’s has opened up a new way for meat lovers with a new menu paying homage to Japanese rice wine. The meal consists of four courses, with a choice of main between its famous roasted prime rib of beef au jus and the char-grilled saga wagyu A4. The acidity and sweetness of the sake both harmonises and cuts the fattiness of the beef, making it an exciting pairing and a must-try. Hailing from Italy is Marango beef, which holds a distinctly tender, juicy and savoury taste profile. The cattle are brought up with a specific diet of hay, corn, linseeds, soya shoots and beetroot — the reason for its perfect marbling. Now, the beloved European beef is available for patrons of Hong Kong’s Porterhouse. Choose from roast beef-style topside, barbecued brisket, stir-fried Picanha rump or the classic grilled flank. Can’t decide? There’s an all-you-can-eat-beef special that runs from Sundays to Tuesdays, so you can enjoy as much as you want, in any style you desire. Slow-roasted to perfection (over 12 hours to be exact), is Westwood Carvery’s signature dish — the USDA prime rib. This isn’t just another slab of meat; its uniqueness lies in the specially designed oven that’s built to cook at very low temperatures over long periods of time to preserve the beef’s meaty and juicy goodness. The roast is served with your choice of potatoes and the house’s creamy, homemade horseradish and a generous pour of vegetable and beef bone jus. Alternatively, the prime rib can be enjoyed in the form of a sandwich with crispy onions and melty raclette cheese. In five decades, Wolfgang has conquered over 12 cities and is a favourite of many. It’s hard to talk about steak without bringing up the restaurant — for its fresh-off-the-grill beef is almost certainly memorable. The prime Angus beef is dry aged and cooked in a special broiler, giving it that crispy crust and tender centre. We recommend the Porterhouse to be shared (or not), and to try both tenderloin and strip. Don’t forget to save some room for their infamous Key Lime Pie, which is the perfect finale to a meaty feast.